For first-year courses in Composition. 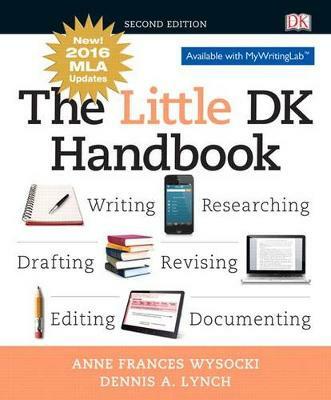 This version of The Little DK Handbook has been updated the reflect the 8th edition of the MLA Handbook (April 2016). * An Accessible and Visually Engaging Guide to Writing Distinctively designed, The Little DK Handbook stands apart from other handbooks. Visually rich two-page spreads marry design and content in a way that makes information appealing and understandable. Students will learn to narrow down topics, find and cite sources properly, present information clearly, craft arguments and hone their voices, and adhere to conventions. With more attention to research particularly online research than other handbooks, The Little DK provides a solid foundation in information literacy. Grammar and documentation (MLA, APA, CMS, CSE) are presented in an approachable, accessible way. The groundbreaking layout creates a consistent look and feel that helps students connect with the material, find information, and recognize solutions to writing problems they often don t know how to look up. *The 8th edition introduces sweeping changes to the philosophy and details of MLA works cited entries. Responding to the increasing mobility of texts, MLA now encourages writers to focus on the process of crafting the citation, beginning with the same questions for any source. These changes, then, align with current best practices in the teaching of writing which privilege inquiry and critical thinking over rote recall and rule-following. "